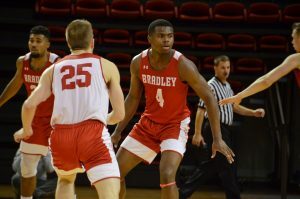 Though seniors Andrew Warren and Dodie Dunson combined for 44 points, Bradley basketball managed to drop its lone public exhibition to Div. II Quincy University Hawks 86-80. 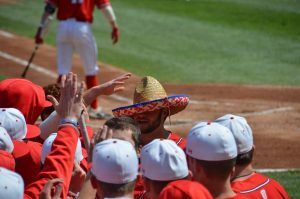 The Braves played without All-Missouri Valley Conference players senior Sam Maniscalco and junior Taylor Brown but coach Jim Les wasn’t allowing that to be an excuse. The Braves got into foul trouble early and often. The Quincy Hawks went to the free throw line 41 times and converted 31 attempts. 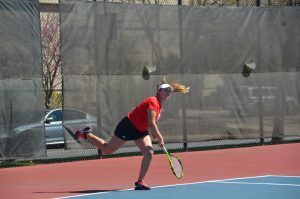 “I don’t know if we played too aggressive, but we just kept reaching and throwing our hands in there, trying to hit balls that we couldn’t get,” freshman Jordan Prosser said. Aside from Warren and Dunson, freshman Walt Lemon, Jr. was the lone player to break double figures for the Braves with 11 points. Prosser made his Braves’ debut after sitting out last year. Warren was one of the few bright spots for the Braves as he scored 26 points and was four-for-eight from behind the arc in 38 minutes of play. Junior Will Egolf struggled from the field and the free throw line. He shot 3-13 and 2-5 respectively. Les said he believes the lack of effort against Quincy started at the top. The Braves open up the regular season at 8 p.m. tonight against Div. II Texas A&M-Kingsville at home in Carver Arena.